Often called simply the Bulldog, is a determined and powerful breed, They are very obedient and affectionate, particularly towards children. Related to the Mastiff, the Bulldog was originally breed for bull-baiting. The sport was band in 1835 due to the excessive cruelty to both dog and bulls. To make them more agile, they were breed to have short legged and huge jaws to grab onto their prey during fighting. After bull-baiting the dog was used for dog-fighting in which it was considered to small and eventually was superseded by the Bull Terrier. 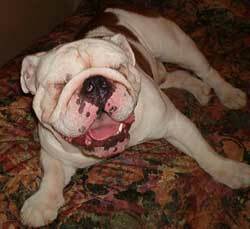 The bulldog has a very smooth coat, wrinkly cheeks, powerful front legs and smaller hind legs. Contrary to classic cartoon parodies that depicted the bulldog as ferocious and wearing a spiked dog collar, the bulldog is not a vicious dog breed and gets along well with both humans and other dog breeds. Bulldogs are very friendly, but stubborn and protective. Bulldogs tend to have breathing problems, as their flat face restricts air. Other common health problems include cherry eye, allergies, and (among older bulldogs) hip problems and cataracts.